U.S. Secretary of State Rex Tillerson speaks at the U.S. embassy in Riyadh, Saudi Arabia, October 22, 2017. ISLAMABAD - As U.S. Secretary of State Rex Tillerson heads to Pakistan on Tuesday to pressure Islamabad to act over militants targeting Afghanistan from its soil, anxious Pakistanis may be equally interested in dissuading Washington’s deepening ties with India. Islamabad views its much-bigger neighbor as an existential threat and the two nations have fought three wars since their violent separation at the end of colonial rule in 1947. Tillerson, due to meet Prime Minister Shahid Khaqan Abbasi and Pakistan’s powerful military chiefs in a one-day visit, is expected to urge Pakistan to do more to root out Afghan Taliban and Haqqani network militants operating on its soil. But he is also expected to hear Pakistani officials warn him that drawing nuclear-armed India deeper into Afghanistan would destabilise the region and do little to end the 16-year war that is now America’s longest military conflict. “Bringing India into the mix is like adding kerosene to fire,” said Miftah Ismail, a state minister and close ally of Prime Minister Abbasi. Many Pakistanis feel betrayed that its traditional ally is now cosying up to India over Afghanistan. But the anger runs both ways. The United States accuses Pakistan of playing a double game since 2001, offering public backing to Washington while turning a blind eye, or even at times assisting, the Afghan Taliban and other militants who carry out deadly attacks against U.S. forces and their allies in Afghanistan. Pakistan supported the Afghan Taliban in the 1990s as a hedge to Indian influence in Afghanistan, and analysts say its military and security services maintained ties long after the Taliban regime was toppled in 2001. Pakistan denies providing a safe haven for Afghan Taliban and other militant fighters. 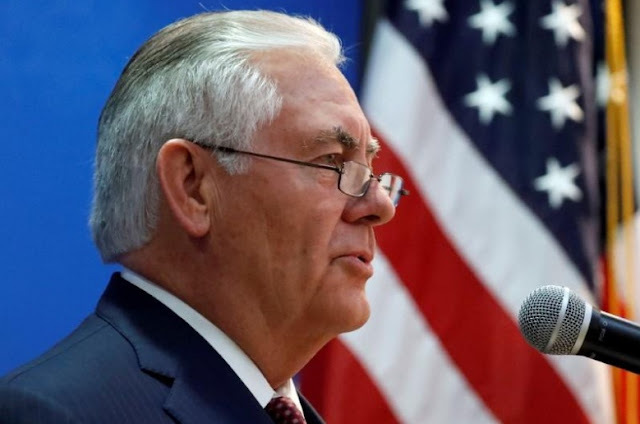 Tillerson, during a visit to Afghanistan on Monday, said Washington has made some “very specific requests of Pakistan in order for them to take action to undermine the support the Taliban receives and other terrorist organizations receive”. U.S. Defense Secretary Jim Mattis earlier this month said the United States would try “one more time” to work with Pakistan in Afghanistan, before opting for more punitive measures. President Donald Trump has vowed to be tougher on Pakistan than his predecessors. The United States has threatened further military aid cuts and U.S. officials have mooted targeted sanctions against Pakistani military figures, but in the past two weeks there have been hints of a slight thawing in ties. U.S. Vice President Mike Pence and Tillerson last week called Abbasi to thank Pakistan after its army rescued a U.S.-Canadian couple who were held hostage by the Taliban-allied Haqqani network for nearly five years, along with their three children born in captivity. Relations were further boosted when Omar Khalid Khorasani, leader of the lethal Jamaat-ul-Ahrar (JuA) group who Islamabad had been trying to catch for years, was killed by a U.S. drone strike last week. India has increased aid to Afghanistan in recent years and last year promised to ship more arms. Such moves have aggravating fears in Pakistan that it will find itself wedged between two hostile neighbors. Islamabad bristles at the idea that India holds the key to ending the Afghanistan conflict, and fears U.S. meddling could unsettle a delicate balance of power in South Asia. “Promoting a higher involvement of India in Afghanistan will only worsen the historic strategic rivalries playing out in the region,” said Sherry Rehman, Pakistan’s former ambassador to United States and a senior member of the opposition Pakistan People’s Party. Pakistan points to the 3.5 million Afghan refugees it hosts as proof that it has more than anyone else to lose from chaos in Afghanistan, and has emphasized the need for greater cooperation and intelligence sharing with United States and Afghanistan. But while Pakistan may not like it, India looks set to continue playing a role in Afghanistan, according to Sushant Sareen, a foreign policy analyst at the Vivekananda International Foundation, a think-tank with ties to the government of Indian Prime Minister Narendra Modi. “The message is very clear that India is an important player when it comes to coordinating policies between Afghanistan and Washington,” said Sareen. As U.S. Secretary of State Rex Tillerson heads to Pakistan on Tuesday to pressure Islamabad to act over militants targeting Afghanistan from its soil, anxious Pakistanis may be equally interested in dissuading Washington’s deepening ties with India.